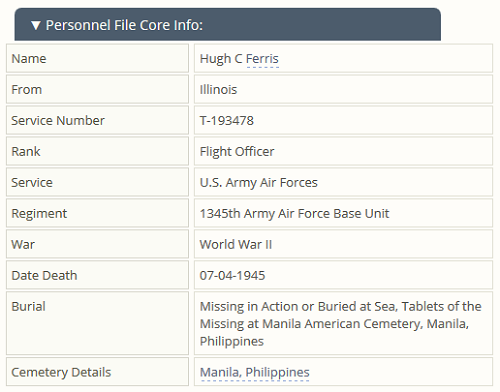 Hugh Crockett Ferris was the co-pilot and first officer of an Army Air Force C-54 that left its base at Barrackpore, India, on July 4, 1945, bound for the airfield at Kunming, China. It never arrived. 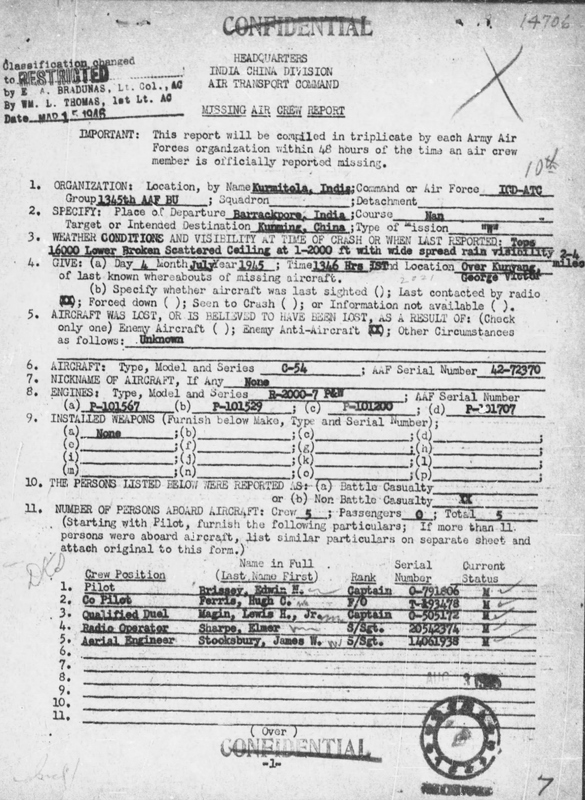 Ferris and the four other members of the crew are listed as missing in action. The aircraft was assigned to course “Nan”, which took them over the “Hump” at its lowest gap, somewhere about 15,000 feet. This course was commonly used because the aircraft flying to Kunming were usually heavily loaded and unable to fly a higher route. 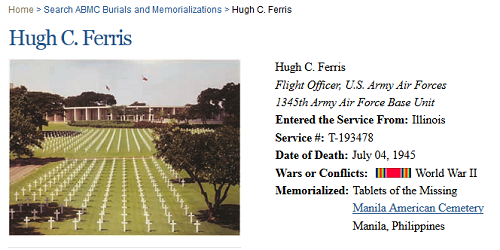 Ferris’s unit was the 1345th Army Air Force Base Unit (ICD, ATC) (433 NY) – Kurmitola, India. Hugh Crockett Ferris was born in 1920 to Howard James Ferris and Emily Crockett. He is a seventh great grandson of Jeffrey Ferris through Joseph. He was not married. He had an older brother and two sisters. He managed a year or two of college at the University of Illinois before the Army, allowing him to become an officer and a pilot. 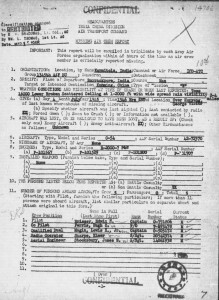 Report on the loss of the aircraft that Hugh Crockett Ferris was aboard during WWII. Click for a larger image.